In continuation of our consumer waste series, we examine the challenges faced in the area of plastic waste production and management. China has a big history with plastic. Throughout its rise to economic prominence, China has manufactured and exported a huge amount of plastic products to eventually become the world’s largest plastic producer in 2013. More recently, China’s domestic consumption of plastics has skyrocketed as well. As a result of this production and poor internal management, China is also leading the world in terms of plastic waste, specifically the amount of plastic debris contributed to our oceans – already China is responsible for an estimated 28% of the plastic swept into our waterways. With another 300 million urban residents expected by 2025 and growing rates of consumption, it is vital that China acts to more efficiently deal with its plastic waste. Tied to China’s plastic exports is the repurposed (recycled) plastics market. As the Chinese economy grows, its demand for repurposed plastic does also. For the past few decades China was buying as much repurposed plastic as possible, especially from the United States. In fact, scrap used to be America’s top export to China with plastic scrap exports reaching $11.3 billion in 2011. This stopped, however, in 2013 when China started the Green Fence Initiative; it significantly tightened restrictions on importing repurposed materials and other scrap for processing, as well as increased inspections. In the past, China would accept any standard of repurposed material and anything that couldn’t efficiently be processed would end up in Chinese landfills. Although profitable, this practice resulted in mountains of waste developing within China, posing both environmental and health risks. 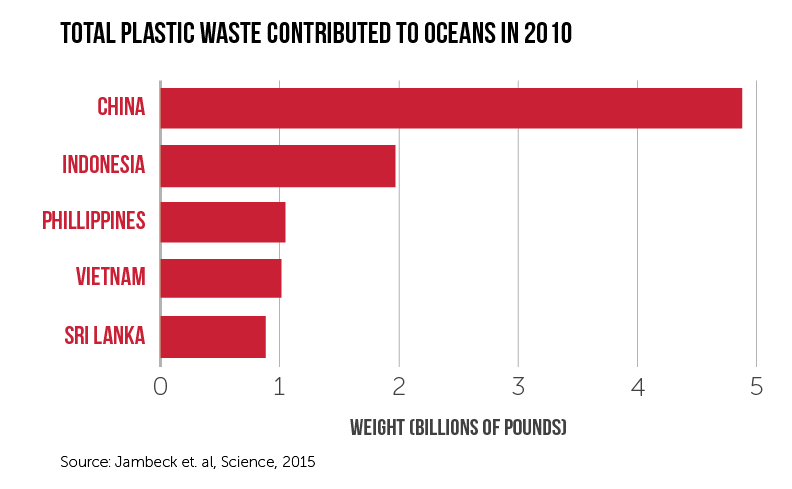 The United States now faces a huge surplus of plastics, as China will only accept the least contaminated of materials. As it stands, even with a seemingly endless supply of usable plastics, domestic American recycling firms are losing money processing the materials that they would normally send overseas. This means much more plastic waste in American landfills until the proper investments are made in recycling infrastructure, but for China it means lower levels of non-domestic waste entering the system. Despite receiving less international plastic waste, China is making up for it domestically. With the rise in affluence, China is now consuming much more plastic. Per capita consumption of plastics more than doubled from 22 kg in 2005 to 46 kg in 2010. This is still far behind those of developed nations such as the United States at about 170 kg per capita, but, nonetheless, it is growing exponentially. Packaging – As we touched on in a previous article, packaging waste is a huge concern in China. Plastics are integral to most types of packaging, and the rise of e-commerce and delivery services continues to lead to significant amounts of waste. Plastic bags are such a problem that they are referred to as white pollution. This still persists despite a national ban on the bags being in place for 5 years – enforcement of the legislation has been lax. Agricultural – Plastic is increasingly being used to boost efficiency and crop yields in agriculture. Chinese farmers use about 2.5 million tons of plastic sheeting a year to prevent moisture evaporation, protect against weeds, and insulate in the off-season. Food production is a top priority for the world’s most populous country, so cutting down on this waste stream is particularly difficult. High Quality Consumer Plastics – With a growing middle class, the demand for high-quality plastics is soaring. The domestic automotive industry is a large contributor to derived demand for such high quality plastic, as is the healthcare market. As the country moves towards universal health care for its 1.3 billion-and-growing population, medical device spending is predicted to expand tremendously, in turn increasing the size of the waste stream. Although the obvious benefits that plastics provide cannot be denied, we cannot be blind to the obvious disadvantages. A fundamental quality of plastic is its resistance to degradation in any environment, and this quality is made most evident in the world’s oceans. 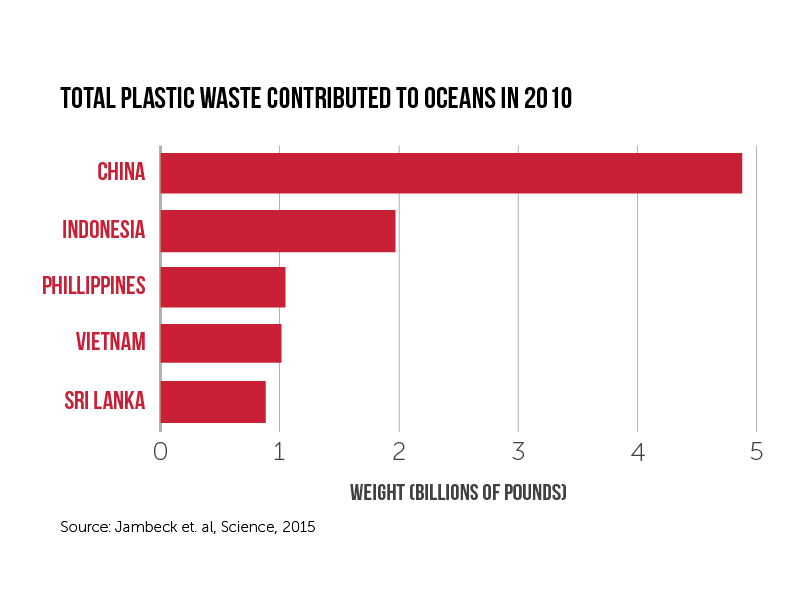 Asia is leading the rest of the world in plastic debris dumping, but even among the top 5 worst offenders China is far and away the prime perpetrator with almost 5 billion pounds of plastic waste contributed to the ocean in 2010. The waterways have become so saturated with plastic that even Chinese Sea Salt has become contaminated. Plastic particles, usually no larger than .2 millimeters in diameter, have been found in table salts all across China according to a study conducted by East China Normal University. These plastic particles, also referred to as microplastics, are especially malicious because of their ability to absorb other harmful contaminants. Besides microplastics, plastics are now present at virtually every level of ocean ecosystems. They are ingested by large amounts of marine organisms, especially those that comprise the international seafood industry. And this means, of course, that we too are at risk of ingesting this plastic through the food chain. An Exploding Population – China’s waste system was simply not designed for the level of scalability necessary to cope with the levels of waste produced by China’s rapidly growing population. Changing Consumer Habits – Average incomes and purchasing power are increasing across the nation. Individuals are consuming at a higher rate, especially products involving plastic. Attitudes Towards Waste – General attitudes, especially in more rural areas, tend to not place value on proper waste disposal. Waste Collection – Much of the waste is not even collected in the first place, with estimates going as far as to say only 40% of all waste is collected. And even when collected, it is estimated that as much as 10% disappears between collection and dump sites. Landfill Management – Many of China’s landfills, much like the nation’s population, are located along the coast and waterways. Even after the waste makes it to these sites, mismanagement and poor maintenance leads to much of this waste being swept into the water through wind and rain. We can see that this problem is only growing, with China estimated to more than double its annual output of plastic waste by 2025. Plastic waste is very much an international problem, but targeting the main five contributors, Vietnam, Thailand, the Philippines, Indonesia and especially China would help to reduce global plastic waste runoff by as much as 45% over the next ten years. Short Term – We need to first develop basic waste collection infrastructure and cut down on waste leakage in transportation and landfills. Waste treatment only starts to become truly efficient and profitable when working at scale. This entails collaboration between the private and public sector to properly incentivize this change. Medium Term – The implementation of commercially viable waste treatment processes must come next. This includes increased recycling infrastructure to capture the more valuable sections of the plastic waste stream. Besides recycling, using other conversion processes to turn the plastic waste into fuel, such as through gasification, or into energy, such as through incineration, is a viable way to really cut down on plastic waste leakage. Long Term – To truly reach long term, sustainable plastic waste solutions, we must change how we use plastic and what types of plastic we use, as well as the processes used in its treatment and recovery. This means a combination of regulations and incentives to galvanize the private sector into real change. These steps, when taking together and with long-term vision, have the ability to stem the problem of plastic pollution. Not only that, but they will bring us closer to the principles of the circular economy that truly allow for value to be utilized out of the waste stream. This, of course, requires all of the various stakeholders to work together to create the incentives necessary for this to happen. With real solutions such as these, we can continue to enjoy the benefits of plastic use whilst working to maintain the health of the environment and iterate to develop better future solutions. For more articles on this topic and other related topics, check out our recent posts (below), and don’t forget to follow Collective Responsibility on social media to receive updates on our latest articles, reports, and events. Tags: China, Consumerism, consumers, Plastic, waste. My students at Yunnan University of Finance and Economics are currently researching how to recycle plastic bottles directly into sandals and shoes for the 300+ million people in the world with no shoes. The project is basically this: Instead of big companies recycling plastic into expensive shoes, how about poor communities with no shoes recycling it themselves using low-tech, manual (non-electric) machines? 1. We want to make simple sandals using ONLY plastic bottles. IS THAT POSSIBLE? 2. We want to make simple tools and machines so communities can make the sandals WITHOUT ELECTRICITY. IS THAT POSSIBLE? 3. Will the plastic bottles have harmful chemicals that will be unhealthy for people to wear? We would appreciate any ideas, suggestions, guidance in order to bring this to fruition. We are a company in Denmark, looking for factories in China, that use recycled ocean plastic for making e.g. tents, bags, etc. There are many factories which can provide materials in RPET, but the plastic is not from the ocean. We are specifically looking for recycled ocean plastic. As mentioned in this article, China is one of the biggest contributers to plastic waste, there must be factories providing RPET from the ocean ? If anyone has any info about this, please kindly contact me. Thank you in advance.